Improving on a car that has won two World Car of the Year awards should be a tall order, but Mazda believes it has achieved this with the new MX-5 RF, which is aimed at the more sophisticated driver who like low-slung sports motoring. 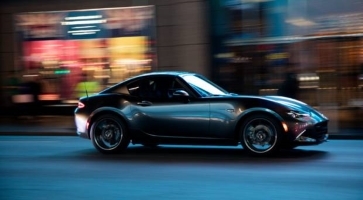 The MX-5 RF (retractable fastback) is a sister car to the MX-5 soft-top, which won the World Car of the Year 2016 award and the World Car Design of the Year 2016 award. This month sees the arrival of the Targa-look retractable hardtop addition, which offers an alternative to an iconic car that has become the best selling two-seater sports car in the world. Now in its 25th year, the fourth generation of the MX-5, loved for its smart looks and agile handling, gives a more all-weather option to those who want a reasonably priced two-seater roadster. It is Japan’s answer to those who hanker after open-air driving but cannot afford a Ferrari or a Porsche. It looks smarter than the fabric version, and Mazda say it gives customers a more relaxed and secure cabin, but still with the opportunity to drop the roof and enjoy the sky in fine weather. The roof is made up of three parts, using aluminium, steel and reinforced plastic, and, with the flick of a switch, it takes only 13 seconds to make it disappear into a compartment behind the seats. Surprisingly, the boot area of 127 litres only loses 3 litres of space with this new design and it can just about accommodate two aircraft overhead-locker-sized bags, a long-running niggle. To cut down on weight, the boot lid, bonnet, suspensions and the back of seats panels are all made of lightweight aluminium. In its fourth generation the MX-5 lost 100kg, but the RF adds 45kg because of the extra equipment and tweaking of some of the underpinnings. The interiors of both versions are still a comfortable if snug fit. Controls are within easy reach and well placed. But from the exterior, the RF wins on looks. Despite a long bonnet and low seating, vision ahead is adequate. There are two petrol engines on offer in the RF: a 1.5 litre 128bhp currently used in the soft-top, and a two-litre 158bhp in a two-litre. Mazda claim 6.1L/100km and 142g/km of C02 for the 1.5 litre, and 6.9L/100km for the two-litre option with 161g/km of C02. The RF has slightly altered suspensions to accommodate the extra weight and give better driving performance. The bigger engine gives it more poke and swifter acceleration, but out for a country drive the 1.5 litre would satisfy most Irish drivers, even if there is 30 bhp less. The MX-5 is a well mannered car with few faults, apart from the weekend-only luggage capacity. It is entertaining to drive and exciting to look at – not a bad combination – and residual values should be good. Prices for the RF version run from €31,490 for the 1.5 litre, and €36,695 for the two-litre, which starts with the GT specification of trim which includes limited slip differential and 17″ alloys. The standard specification for both models includes LED headlights, a Mazda MZD connect communications system, cruise control and air conditioning. The 1.5 litre with GT specification gets 16″ alloys. Automatic transmission is an option, as is a 9-speaker Bose audio system. Because of our uncertain weather, the hardtop is a welcome addition to the MX-5 line-up. The biggest seller is likely to be the €31,490 version. Mazda closed last year with a 35pc sales growth compared to 16pc market growth, and this was on top of a 25pc growth on the previous year, all admittedly from a low base. As well as the RF, a new CX-5 is due here soon. The current model is one of the brands most successful models here and the updated version will make it even more competitive in a hard-fought SUV market.